Director – Ari Sandel, Screenplay – Rob Lieber, Story – Darren Lemke & Rob Lieber, Based on the Books by R.L. Stine, Producers – Deborah Forte & Neal H. Moritz, Photography (3D) – Barry Peterson, Music – Dominic Lewis, Visual Effects Supervisor – Derek T. Spears, Visual Effects – Cubica (Supervisors – Ruben Algarra, Joan Amer & Cesc Bienzobas), Mr. X Inc. (Supervisor – James Cooper), Pixomondo (Supervisor – Phil Jones & Philip Nussbaumer), Soho VFX (Supervisor – Keith Sellers), Special Effects Supervisor – Michael Lantieri, Creature Effects – Legacy Effects (Supervisor – J. Alan Scott), Production Design – Rusty Smith. Production Company – Sony Pictures Animation/Original Film/Scholastic Entertainment Inc./Silverstone Films, Inc.. In the town of Wardenclyffe, New York, teenager Sonny Quinn and his best friend Sam start up a junk recycling business. They are given a clean-up job at the former home of R.L. Stine. During the course of the operation, they find an uncompleted Stine manuscript and the ventriloquist’s dummy Slappy. After reading a spell from the manuscript, they are startled when Slappy comes to life and starts talking to them. They soon discover Slappy has a malevolent side, causing harm to bullies and completing Sam’s science project only for it to blow up the classroom at school. Slappy decides it wants a mother and fixates on making Sam’s mother his. It uses the spell to cause all the Halloween decorations around the town to come to life. Sonny, Sam and Sonny’s sister Sarah fight through the chaos to stop Slappy as he sets out to take over a Nikola Tesla station and broadcast the spell across the country. Goosebumps (2005) was a film based on the books by R.L. Stine, an incredibly prolific author in the field of Young Adult horror. Stine has produced over 150 of the Goosebumps books, along with multiple other series. The ‘Goosebumps film was a modest success and this is a sequel. For the sequel, original director Rob Letterman has stepped away and is replaced by Ari Sandel who emerged from the high school television series Aim High (2011- ) as the director of the high school comedy film The Duff (2015) followed by the time travel romantic comedy When We First Met (2018). The script is from Darren Lemke who wrote the first film and Rob Lieber who should prosecuted for crimes against good taste for delivering the story and producing Peter Rabbit (2018). 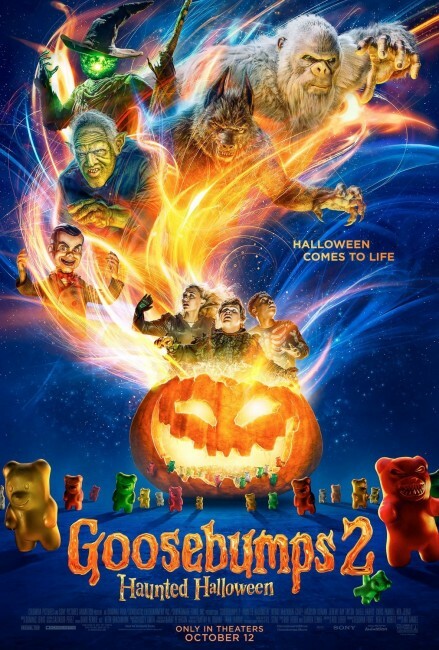 With Goosebumps 2 – which was referred to as Goosebumps 2: Haunted Halloween in the promotion but not on the film’s credits – those involved have clearly been given orders to go away and replicate the first film. The first film had the creations from Stine’s books loosed all over town. We get a similar kind of plot here where Slappy is unleashed from a book and then enacts a spell that brings Halloween figures all around the town to life. There’s a similar trio of teen characters at the centre of the story. The main difference is that Jack Black’s R.L. Stine is only a supporting character who turns up near the end of the show rather than a principal player. (The real R.L. Stine can also be spotted at the end as the principal who hands Madison Iseman her graduation diploma). The first film was saddled with trying to embody all of the Goosebumps stories in one film and so wound Stine in as an actual character with a plot in which all of the characters from his books were unleashed. The main difference this time is that the character of the malevolent ventriloquist’s dummy Slappy (the most popular of Stine’s creations who has appeared in ten books) is promoted to the central menace of the show. With suit and perfect bow tie, nasal quaver and an unsettling high-pitched giggle, Slappy proves a figure you could easily see go onto inhabit a series of films akin to Chucky of Child’s Play (1988) fame. This also serves to make the film plotted more along the formula lines of a typical Stine story – kids accidentally unleash a magic spell, their dealing with bullies and teachers, conspiring to hide the truth from adults, and the fight to stop the chaos unleashed. Goosebumps 2 is adequate – no more, no less. There is certain fun when the various visual effects teams get to unleash all of the Halloween denizens. There’s amusement and fun to watching them loose, even if you know that everything is played so safe that nothing will really threaten anybody. 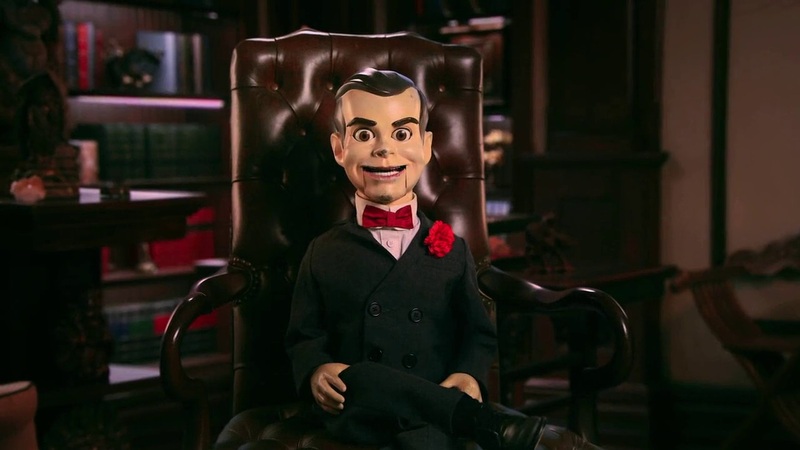 The star of the show however is Slappy – he deserves a grown-up film all of his own.